Arduino boards have a wide variety of compatible displays which you can use in your DIY electronic projects. In most projects, it’s very useful to provide the user with some sort of feedback from the Arduino board. It can be a sensor reading, an ok message or you can create an interface to interact with your Arduino board. Dot matrix. The dot matrix has 64 leds, 8×8. You can control each led individually to display letters, numbers, figures, etc. These dot matrixes can be of different colors. You can attach several of them together to have a bigger area to display. There are some projects on our website to provide you with details how to connect them to Arduino boards and use them. 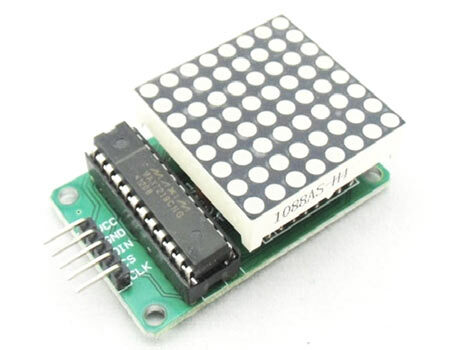 8x8 Dot matrix can be attached with MAX7219 IC. You can read more about 8x8 Dot matrix here and 8x8 Dot matrix with MAX7219 IC here. White OLED display module. This is a tiny display with just 1 x 0.96 Inch. This display has a black background, and displays characters in white. There are other similar displays that can show the characters in other colors. You can read more about it here. 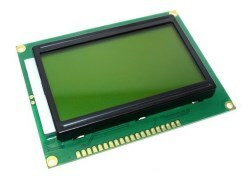 LCD 1602 display. This usually the first display most people use when they first start using the Arduino board. It displays 16 characters in 2 rows (there are also other sizes available). These displays come with a blue or green background and with a backlight. They can be with or without I2C module. 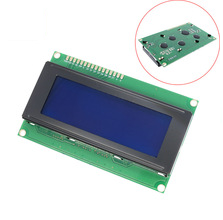 You can read about LCD 1602 display here and LCD 1602 I2C display here. There are some projects on our website to provide you with details how to connect them to Arduino boards and use them. LCD 2004 display. It displays 20 characters in 4 rows (there are also other sizes available). These displays come with a blue or green background and with a backlight. They can be with or without I2C module. You can read about LCD 2004 display here and LCD 2004 I2C display here. There are some projects on our website to provide you with details how to connect them to Arduino boards and use them. LCD 12864B display. The meaning of LCD 12864B marking is graphic Liquid Cristal Display 128x64 pixels with green backlight. The display can be used to output text or graphics. These displays come with a blue or green background and with a backlight. They can be with or without I2C module. You can read about LCD 12864B display here . There are some projects on our website to provide you with details how to connect them to Arduino boards and use them. Nokia 5110 LCD display. This kind of displays has been used in old Nokia cellphones. The background is grey and the characters or pictures are displayed in darker grey. They are very cheap and easy to use.The display can be used to output text or graphics. 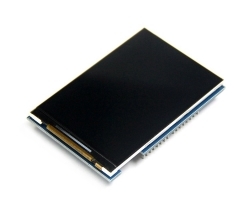 You can read about Nokia 5110 LCD display here . There are some projects on our website to provide you with details how to connect them to Arduino boards and use them. 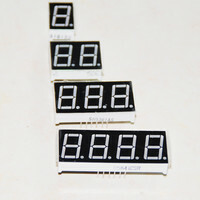 1-digit, 2-digit, 3-digit, 4-digit, 5-digit, 6-digit, 7-segment digital tube LED display. It’s useful to display data from a sensor, use it for time display or as a stopwatch, for example. You can read about it here. There are some projects on our website to provide you with details how to connect them to Arduino boards and use them. 1.8'', 2.8'', 3.2'', 3.5 '' TFT LCD display. These displays can be with or without touchscreen. 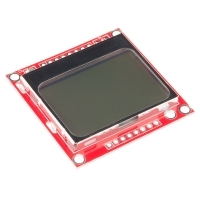 With the TFT display you can display colorful images or graphics. This module has different resolutions and includes the SD card socket and SPI FLASH circuit. You can read about 3.5'' TFT LCD display here. There are some projects on our website to provide you with details how to connect them to Arduino boards and use them. LED 5050 RGB (WS2812B). Put on your sunglasses before wiring up this LED matrix - 64 eye-blistering RGB LEDs adorn the NeoMatrix for a blast of configurable color. Arranged in an 8x8 matrix, each pixel is individually addressable. Only one microcontroller pin is required to control all the LEDs, and you get 24 bit color for each LED. Can be used to output text or graphics. You can read about them here.